SF Weekly’s Summer Guide Party was a small get-together done as both a celebration for the special summer issue and for Widmer Brothers Beer to do a pouring. I literally threw this party together in about 2 weeks. 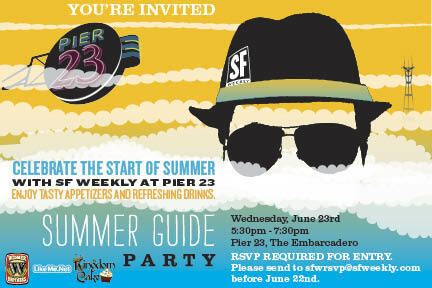 We have trade with Pier 23 Cafe so they were very willing to host the party for us. We had a few sponsors, which included Widmer Brothers, Kingdom Cake Cupcakes, Philz Coffee and Lange Twins Winery. To promote, I ran a few ads in the paper, online, sent out an Emma newsletter to our subscribers, and posted it on various social media websites. We made this party semi-private and had a guest list as we were giving away free food and drink. Food was provided by Pier 23 Cafe, and the drink by Widmer Brothers, Lange Twins, and Philz Coffee. At the end of the party, Yak-Pak gift bags were given out to guests filled with a few goodies and the Summer Guide (of course). All in all, it was a fun, and low-key summer party in San Francisco.